Have you been noticing the dense thick mats of vegetation growing along the Ohio River? You probably have fouled your motor boat prop while boating through it or noticed your favorite fishing spot being overrun. If given the opportunity, hydrilla will overrun almost any body of water. Thought to be native to India and Korea, hydrilla (Hydrilla verticillata) was first introduced to the U. S. in the 1950s for use in aquariums. 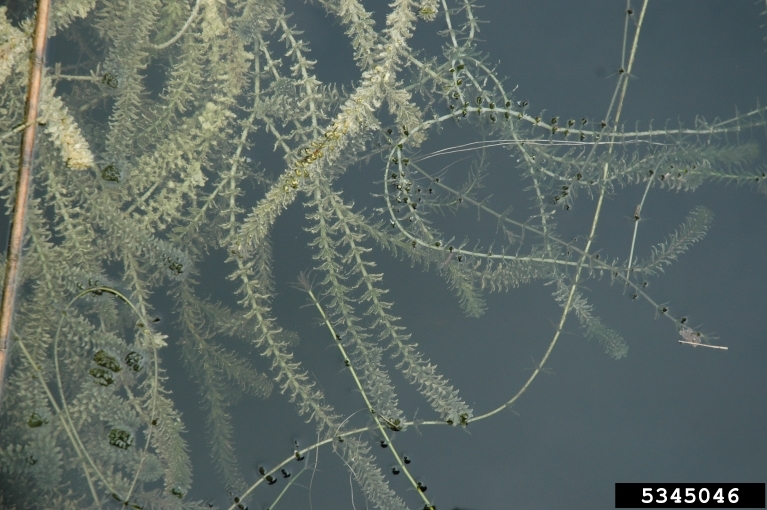 Some of the hydrilla spread can be attributed to aquarium hobbyists discarding unwanted aquarium systems into natural water bodies. However, hydrilla is mostly spread by vegetation fragments that get caught in boats and boating equipment. Since the 1950s, hydrilla has spread throughout much of the United States where it is confined to slow-moving, freshwater bodies, such as the Ohio River and the Florida Everglades. Hydrilla affects the ecosystem by altering water chemistry, which can lead to large fish-killing events. It requires less sunlight to produce food, giving it a competitive advantage over native vegetation; in addition, it grows in a dense mat that shades-out other submersed plant species. Hydrilla reduces water flow by clogging irrigation and flood-control canals and culverts; and has become a major obstacle in hydroelectric generation. Economic costs of hydrilla are estimated in the millions due to lost recreational opportunities, and maintenance costs associated with irrigation and hydroelectric works. To identify hydrilla, look for submersed plants forming dense mats at the surface of the water. Leaves are small, green, slightly translucent, and often have saw-like edges. The mid veins of the leaves are often tinged red and have sharp teeth. 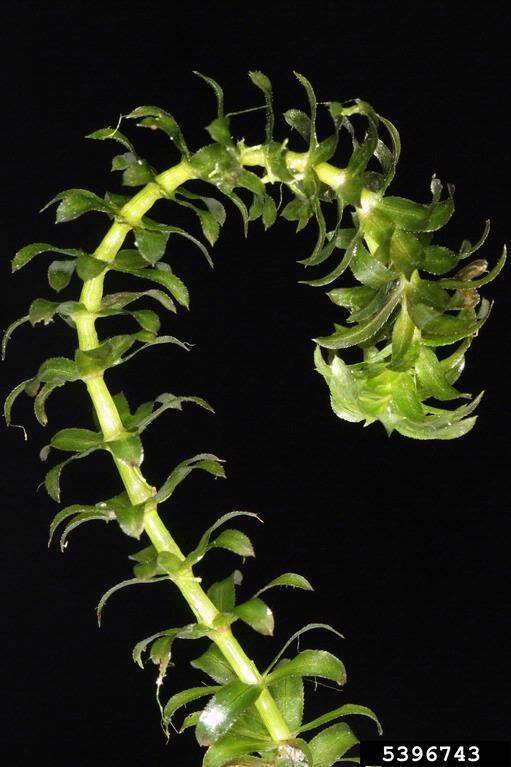 Leaves are attached to the stem in whorls of 4-8, but predominately 5. Vegetation near the surface has a pipe cleaner like appearance that is approximately one inch in diameter. If the plant is dug up, a small potato like tuber can be found under the mud. Clean and dry anything that came in contact with water (boats, trailers, equipment, clothing, dogs, etc) with hot water that is at least 104 degrees (for dogs, use as warm of water as possible and brush its coat) or a high pressure sprayer. If possible, allow to dry for 5 days before moving to a new body of water. Never release plants, fish, or animals into a body of water unless they came out of that body of water. 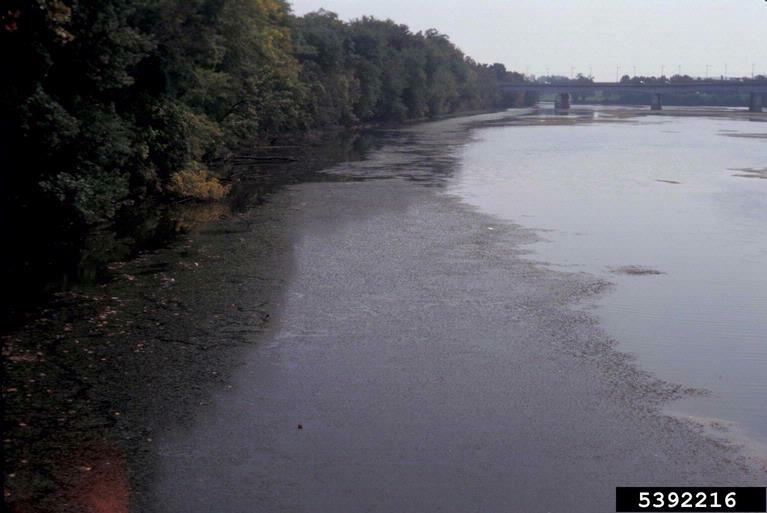 To report any inland populations of hydrilla not on the Ohio River or to have any additional questions answered, contact Eric Boyda at appalachianohioweeds@gmail.com or 740-534-6578. It is important that we clean our boating equipment to prevent the spread of invasives like hydrilla. This new publication is a little overwelming for a landowner, but is full of useful information about cleaning equipment to reduce the spread of invasive flora and fauna. DiVittorio, J., M. Grodowitz, and J. Snow, 2012. Inspection and Cleaning Manual for Equipment and Vehicles to Prevent the Spread of Invasive Species. U.S. Department of the Interior, Bureau of Reclamation, Technical Memorandum No. 86-68220-07-05. This manual provides uniform guidelines for inspection and thorough cleaning of vehicles and equipment that come in contact with pest and invasive species during Reclamation work. The information in this manual will help personnel to understand how pest and invasive plants and animals are spread and will provide instructions and recommendations to reduce their spread. The general types of equipment described in this manual are: rubber-tired land vehicles, tracked land vehicles, personal use equipment, construction and facility equipment, and watercraft. In addition to inspection and cleaning procedures, a section with descriptions of species of concern is included.